Pendulum Effect: Each time a Spell Card is activated, place 1 Spell Counter on this card when that Spell Card resolves. 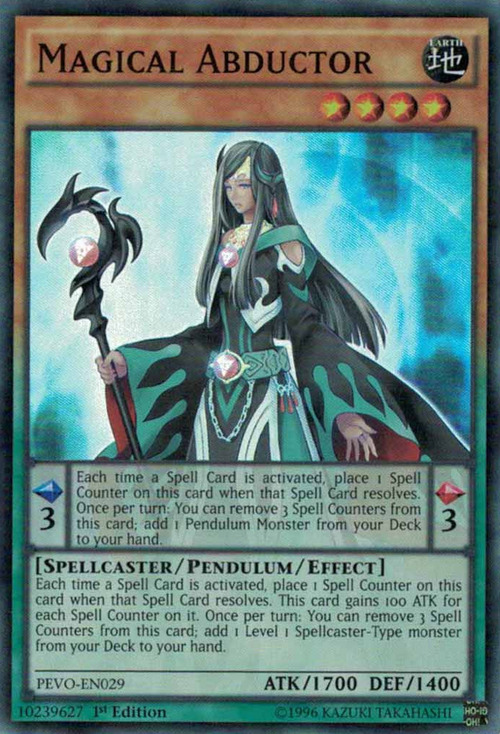 Once per turn: You can remove 3 Spell Counters from this card; add 1 Pendulum Monster from your Deck to your hand. Monster Effect: Each time a Spell Card is activated, place 1 Spell Counter on this card when that Spell Card resolves. This card gains 100 ATK for each Spell Counter on it. Once per turn: You can remove 3 Spell Counters from this card; add 1 Level 1 Spellcaster-Type monster from your Deck to your hand. This monster is the Pendulum Monster version of Magical Exemplar. This monster has a further advanced form: Magical Something. This monster has three Spell Counters present in its artwork: one on her staff, one on her belt, and one on her cloak. This likely references the number of Spell Counters that have to be removed to activate any of this card's effects. This is the first Pendulum Monster that can have counters be placed on it while it is in the Pendulum Zone.